Our story began on October 20th, 2010 when our beautiful son Francesco was born. What was the best day of our lives, we also knew was only the beginning to a very long road ahead. Our son was born with a rare and severe heart defect called hypoplastic left heart syndrome. This CHD (congenital heart defect), in layman's terms, meant that our son was born with only half of his heart and would need multiple open heart surgeries, the first one at just days old. After his first open heart surgery our son was hospitalized for 5 weeks. Then on Thanksgiving day, we finally brought our special boy home. Everyday was full of surprises and worry, but then also full of so much love and happiness. A heart baby is at high risk for catching anything from a cold to RSV, and if any of that happened it would hit them one thousand times harder than a healthy baby, needless to say we made our home fun and exciting everyday as there was really no where else we could go other than to doctor appointments. 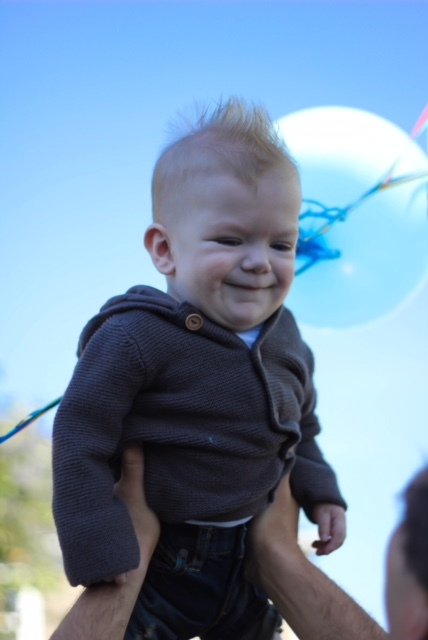 By the time Francesco was 3 months old, he was already starting to struggle and after an ER visit and one week in the hospital the doctors decided it was time for his second open heart surgery. Recovery after surgery didn't go very well and we thought we almost lost our baby boy. But thanks to lots of prayers and the expertise of his doctors, we were blessed to bring our son home again safe and sound. It may seem as though our little boy was just a sick kid, but he couldn't have been more the opposite. I've never seen a happier little boy with the most contagious laugh. His blues eyes could light up any room and he gave us the best days of our lives. If anyone could appreciate the little things in life like fresh air, long walks and Mickey Mouse, it was our son. His patience, kindness and strength made us the most proud parents. I've never looked up to anyone more than my son, he is our hero. The winter came and Francesco lost interest in eating a little but was more than happy for me to syringe him his milk, so for us not so unordinary. He started showing some other signs that maybe his heart or lungs would need another "tune up" and early morning on December 13th, 2011 we went in to the ER once again. It's tough to walk through this next month, but let's just say it was a roller coaster ride, the scariest kind, and on January 7th, 2012 the Lord decided our son had been through enough and gave him his angel wings. We were beyond devastated. Our worst nightmare had come true and there are no words that can describe that pain, or the pain that we feel everyday without seeing those beautiful blue eyes, or hearing that contagious laugh. We may not physically be with him right now, but he is EVERY single moment in our hearts. What can we do when the higher power has chosen our path and we are angry and broken? We have to make a change! We decided that we would do everything in our power to help increase the survival rates, and better the quality of lives for children born with heart defects like our angel Francesco. These special kids deserve the opportunities in life that healthy kids have. We promised our son we would continue his fight, and that is exactly what we are doing. In June of 2012 we founded "Cesco's Heart". We are a non-for profit organization, and 100% of our proceeds go to Advocate Children's Hospital in Oak Lawn, IL. Advocate Children's Hospital is where our son had both of his heart surgeries, several procedures, and where his cardiologists cared for him, along with many other pediatric cardiology patients at their heart institute. Our funds go specifically to support the research and advanced treatments for pediatric cardiology. We are an official philanthropic organization for Advocate Children's Hospital as well as members of their President's Society. Advocate Children's Hospital is our second family. Our relationship with them is very special as they spent four months with Francesco in the hospital as well as numerous doctor visits. We visit the doctors and patients often. On holidays our family goes to the hospital and delivers Christmas presents, Easter Baskets, and other goodies to the patients in the pediatric cardiac intensive care unit. The kids always get excited when we come. Even if it just brightens their day for a moment, or keeps them busy for a few hours, we as parents of a sick child know how important that is. Yes, we may put a lot of work into this organization and get to share the heart warming moment of seeing the patients joy when we visit, but we couldn't do any of this without our supporters! Every fall we hold our annual "Cesco's Heart" fundraiser. This past year was our 7th annual event and we held it at the Elgin Country Club in Elgin for our third consecutive year. Families gathered and enjoyed good food, fun entertainment for the kids and great company. We had a fantastic raffle and auction table where there were 50 prizes for all ages to get excited about. We have been so fortunate to have incredible raffle prizes donated every year by friends, family, and local businesses. It is thru our fundraiser tickets sales, raffle ticket sales, auction table, and outside donations year round that we raise the funds to support our mission. In the past six years we have been able to donate $100,400.00. The support that we get each year is overwhelming and inspiring. It allows us to continue to fight for our son and all of his "heart buddies". Our gratefulness goes beyond words.